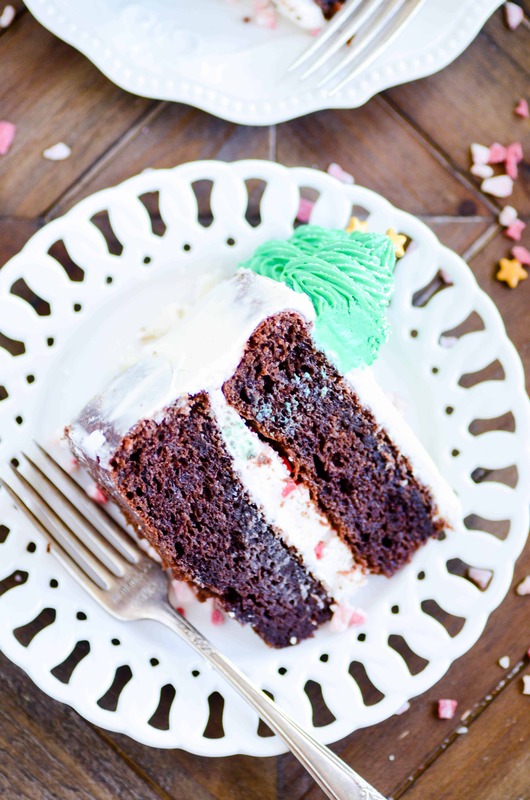 My favorite chocolate cake filled with a vanilla peppermint buttercream. 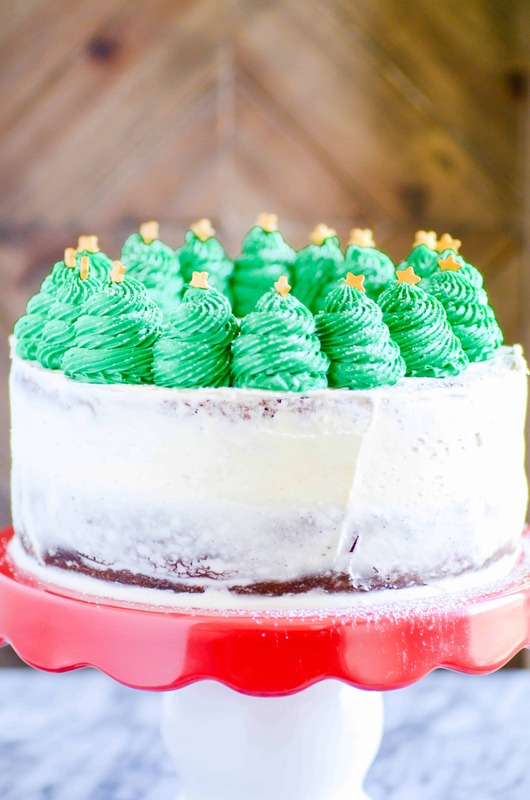 Cute and easy Christmas trees on top make this a perfect cake for your holiday festivities! I am not a cake decorator. Like at all. And also, I’m the worst cake cutter ever. Not that that has to do with the making of the cakes. I’m just saying, that’s all. But I’ve discovered that I kind of love making cakes anyway. Is that so weird?? And I think there’s a place for all of us non-cake-makers-who-like-making-cakes-anyway in the world. Thanks to the naked cake trend, amIright?! Because, oh my gosh, that just couldn’t have made things any easier. Who else was so thrilled when it became cool to have your cake show through the frosting? ???????? Because that happens to me every time I frost a cake anyway, so win-win that it’s now en vogue! Woot! Another thing that’s working out for those of us less-talented in the cake decorating arena? It’s also now cool to pipe swirlies all over the top of your cake. And then dump on some sprinkles, and voila! Because we can SO do that. Seriously. I could not be more on board with current cake trends. Best thing ever. 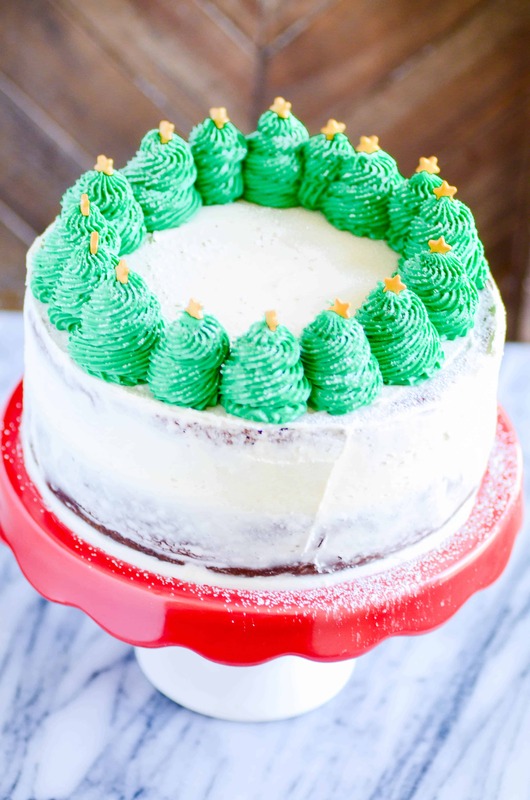 Which brings me to today’s Christmas tree cake that I am basically freaking out over. How cute is this??? Pssssst. Don’t tell anyone, but it is crazy crazy easy. 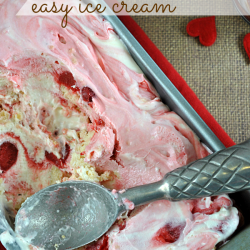 A) an offset spatula to scrape on that buttercream. If you don’t already own one, seriously go pick one up. You’ll use it for everything, and it is totally worth owning! B) Wilton Tip 4B Open Star Piping Tip. You can get this anywhere cake decorating supplies are sold. I bought mine at Michaels. C) These wilton gold star sprinkles!! 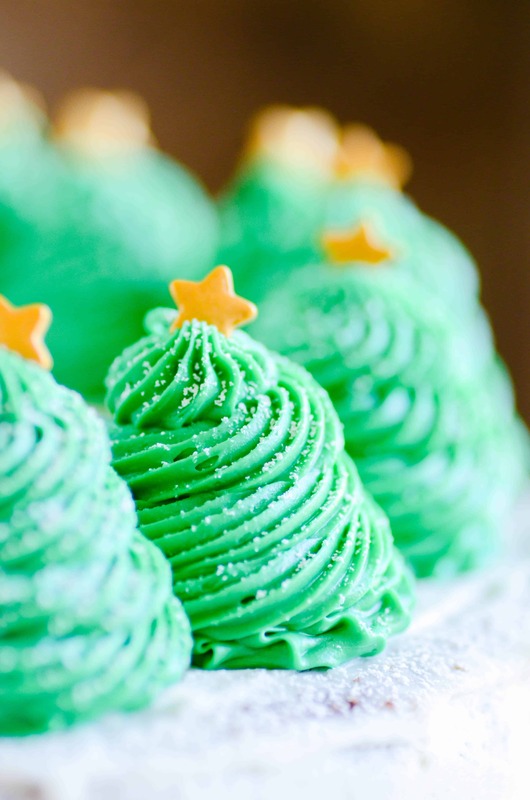 There are different things you could top your frosting trees with, but how absolutely perfect are those sprinkles?? I bought mine at Michaels. Ok, let’s talk about the inside of the cake for a second. 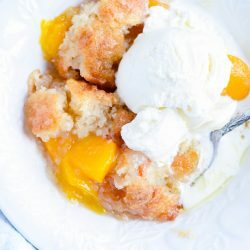 It’s also simple, but delicious! I used my all-time favorite go-to chocolate cake, this doctored up cake mix recipe. It is absolutely the best cake on the entire planet, and no one will ever convince me that a completely from-scratch chocolate cake is better than this one that starts with a mix. Period. 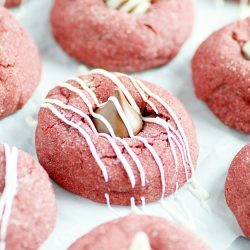 Add to that cool and creamy peppermint frosting. Mmmmm. And my favorite little bit? Andes Peppermint Crunch bits sprinkled on top of the buttercream. I like using Andes bits better than crushed up candy canes because for 1) it’s easier on the teeth. And for 2) they are SO GOOD. If you can’t find the bits, just buy the Andes peppermint bars. I’ve seen them at Target and Walmart. You can chop those up into the exact same thing as the bits. 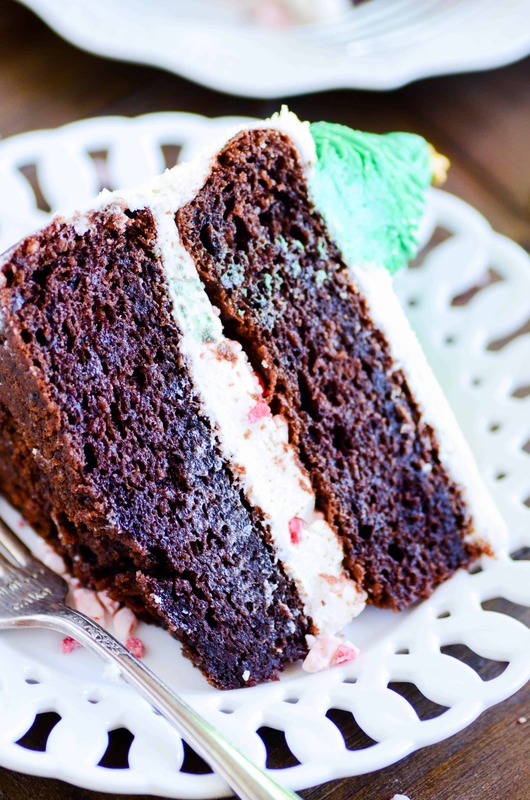 It’s the perfect texture and flavor addition to the middle of this cake. Alright, friends. That’s it from me for today! Enjoy the recipe and Happy Holidays ????. In a stand mixer, whisk the butter until smooth. Whisk in a cup of powdered sugar and 1 tbsp of liquid (start with the vanilla, and then the milk) at a time. Scrape down the sides in between each addition. Finally, add the peppermint extract. Start with 1/4 tsp and increase it depending on your taste preferences. Place one layer of the cake on a serving plate or cake stand. Spread a layer of the buttercream over the cake, and sprinkle the Andes bits over the buttercream. Place the second layer of cake over the buttercream. Frost the outside of the cake with a thin layer of the buttercream. 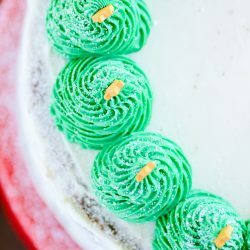 Color the remaining buttercream green. 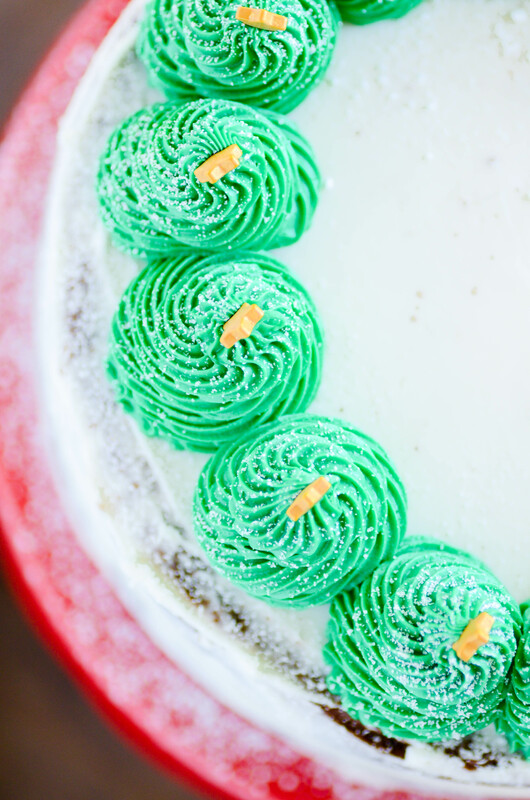 Pipe swirls on top of the cake with the Wilton 4B Star Tip. Top with gold star sprinkles and dust with powdered sugar to look like snow. Store at room temp until serving.